Why Tulsi is not offered to Lord Ganesha? Ganesha is offered all sorts of sacred flowers, fruits and sweets in worship but not the Tulsi leaves, the sacred basil. Tulsi is very much venerated by hindus, specially the vaishnavas, but it is not offered to Ganesha because of a curse. A story says that once Ganesha was engaged in deep meditation on the banks of ganga on Vishnu. Ganesha resplendent in yellow robes looked very attractive. His body was besmeared with fragrant sandal paste and ointments. Costly jewels decorated his effulgent body. As Ganesha was thus engaged in prayers, there came Tulsi. As soon as she saw Ganesha, she fell in love with him and requested him to take her as his wife. These words of Ganesha annoyed Tulsi. She took it as her insult and got angry. In her anger she cursed Ganesha saying, “You will definitely get married against you wishes”. Ganesha, the best of the gods cursed her in retaliation saying, “You would be possessed by a demon in marriage, and then under a curse from the saints become a plant”. On hearing this curse, Tulsi grew repentant and praised and prayed Ganesha. 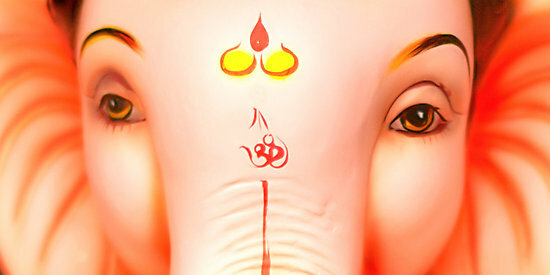 This softened and pleased Ganesha and he said, “O Tulsi, you will be regarded supreme among the plants. All the gods will love you, but you will be specially dear to Krishna. Whosoever worships the lord with your leaves as offering would achieve liberation in heaven, but you will always be unacceptable by me.” With these words Ganesha engaged himself in meditation. Meanwhile Tulsi retired to Pushakara, the holy lake and began severe tapas. Later under ganapati's curse she became the wife of the demon king called Shankhachuda. She lived with him as his beloved wife, but then her husband was killed by Shankara and she turned into a plant of holy basil, so dear to Lord Hari. Good to read these stories. Thanks to those who post these stories! Great happened to see this website! Much useful!